Can a Felon Become a Pharmacy Technician? Nothing is the same after a felony conviction. What a challenge felons face after leaving prison! Felons often think no one will hire them, but there are resources available. Many employers have discovered that felons make good employees, although it might be in a different career than they had before. 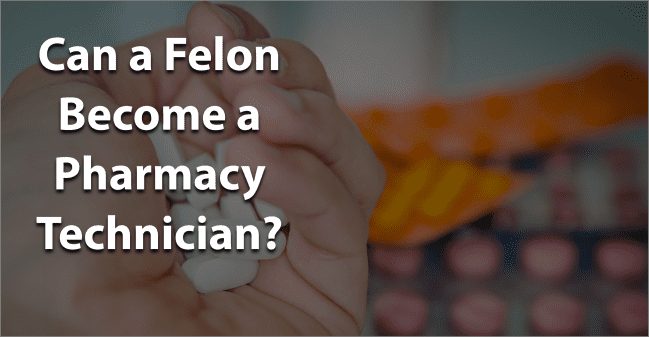 This blog post will address the question of whether a felon can become a pharmacy technician. What Education/Training Does a Pharmacy Technician Need? A pharmacy technician is a person trained to work under the supervision of a pharmacist and assist in dispensing prescription medication to customers or health professionals. In many states, a pharmacy technician can mix or prepare some medications and call physicians for refill authorization. They work in a variety of settings with the majority working in a pharmacy or drugstore. Some are employed in a hospital or other medical facility, preparing and even administering some medicines intravenously. In order to become a pharmacy technician, most individuals complete an educational program in pharmacy technology. Such programs can be found at a community college, technical school, or online. A certificate is earned after graduating, typically within one year. Education also involves practical experience working in a pharmacy. The American Society of Health-System Pharmacists (ASHP) provides accreditation to programs offering at least 600 hours of instruction covering 15 weeks. There are 286 accredited programs. Most states regulate pharmacy technicians. The State Board of Pharmacy in each state can provide specific requirements. Certification is necessary in some states and can be obtained from the Pharmacy Technician Certification Board (PTCB) and the National Healthcareer Association (NHA). The U.S. Bureau of Labor Statistics indicates that there were approximately 398,390 pharmacy technicians in the U.S. in 2016. This occupation is expected to show a 9% growth by 2024. The reason for this growth is the high demand due to the aging of the baby boomer population with accompanying medical problems requiring prescription medications. The median salary of a pharmacy technician in 2016 was $32,170 annually. The median salary is the one for which 50% earn more than this and 50% less. Experience will make a difference in how much a pharmacy technician earns annually. The area of the country in which a pharmacy technician works is also a factor in their earnings. Those on the East or West coast typically earn more than a pharmacy technician that works elsewhere. Many pharmacy technician programs do a background check on applicants for their program. Relevant factors such as type of offense, potential for harm to the public, and potential for recurrence of criminal activity will be considered. A crime of moral turpitude or a drug offense can cause a certification application to be rejected or it might be approved with certain restrictions applied. The type of felony, how long ago it occurred, and an applicant’s age at the time of the crime are usually considered in a decision on certification. If a felon applies for a pharmacy technician program, they need to be honest in reporting any conviction. Even if a felon is successful in being admitted to a program, completes it, and is certified as a pharmacy technician, they still face a challenge in finding a job as a pharmacy technician. At that point, it would be up to the individual employer to make a decision and possibly run a background check. A felony that isn’t disclosed but discovered on a background check is fraud, punishable by being sent back to prison. It is challenging enough for felons, typically seen as dishonest, untrustworthy, and unwilling or unable to follow directions from authority figures. Having their felony expunged can give them a clear record and the chance they need to succeed in becoming a pharmacy technician. Expunging a criminal record allows anyone to honestly state on an application that they have not been convicted of a crime. It is quite challenging, but it could be worth it for a felon wanting to become a pharmacy technician. They have to give themselves the best chance for success by having their record expunged. They could also document any programs, education, or training they have completed. Having support from family and friends is essential. There may also be others like counselors or even previous employers who can help. A felon doesn’t have to be defined by their crime. They can start again and live an honest life no matter how difficult it might seem. What do you think about this blog post? Are you or someone you know been in the situation of trying to become a pharmacy technician with a felony? What was that like for them, and how did they achieve success? Please tell us in the comments below.